The Silver Medal ceremony, which includes a Silver Medal Lecture by the Laureate, will be held on Monday, 3 September 2018, during the Annual Meeting of the EMS in Budapest, Hungary. 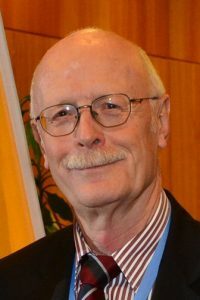 1971 – 2016 Participation in more than 220 WMO sessions and meetings in his role as delegate/principle delegate of Germany (Congress, CBS), Vice-president (CBS), chairman (WG on the Global Observing System, Committee on the OWSE North Atlantic, Co-ordination Group on COSNA, EC Panel on Experts on Satellites), member (WG on the Global Observing System, Advisory WG of CBS, NAOS-Board, EC, Consultative Meeting on High Level Policy on Satellite Matters), observer representing EUMETSAT (EC and Congress), lecturer at various WMO seminars and conferences. EMS Silver Medal. The EMS Silver Medal was established in 2008 to honour important contributions to the development of meteorology in Europe. The Award is presented annually. Candidates for the EMS Silver Medal are nominated by Member Societies and Associate Members of the EMS. 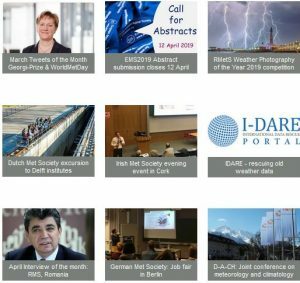 The EMS Awards Committee, consisting of senior members of meteorological institutions in Europe, makes recommendations to the EMS Council for a final decision. Previous recipients were the late Karin Labitzke (Germany), René Morin (France), Lennart Bengtsson (Sweden/Germany), David Burridge (United Kingdom), the late Jean-François Geleyn (France/Czech Republic), Tim Palmer (United Kingdom), Hartmut Graßl (Germany), Peter Lynch (Ireland), Anton Eliassen (Norway), Michel Jarraud (France/Switzerland) and Julia Slingo (United Kingdom). Registration for the Media will be available online from May onwards.